In a sense, so are Singaporean males who've made it through compulsory military service. Much of our time in military training was spent in transit, either sleeping in moving trucks, in trenches dug into the ground, or just standing still during a parade. I guess for the Chinese it applies to both males and females, and for drastically different motivations. Quotable Quote - "If sleeping were to become an Olympic sport, China would win gold, silver, and bronze. In fact all other nations probably wouldn't bother turning up, defeated from the start by the unequivocal Champions of Sleep." I am fortunate to have a job that has led me all over the world, witnessing the diversity of countless cultures, and being fascinated by their contrasts. The most obvious differences are the way we eat or spend leisure time, but we are taught to do these, so such differences are hardly surprising. But some more instinctual or natural activities vary little throughout the world. For example, a person laughing in Russia looks the same as a person laughing in Argentina, Greece, or Uganda. Sleep is another natural activity that we all do on a daily basis, yet somehow no one can do this more effortlessly than the Chinese. The infinite number of environments in which a Chinese person can sleep is nothing short of incredible. They can do it lying, sitting, or sometimes standing. They can do it in a quiet, noisy, or even hectic place. They can do it at any time of day, and seemingly without any hint of self-consciousness. I was once on the furniture floor of a large department store in Nanjing, Jiangsu Province, where all the beds, chairs, and sofas had people sleeping in them. Confused as to what was going on, I asked a local friend to find out what all these people were doing. A quick look at my watch confirmed it was 3:15 pm, and while my friend went off to enquire, I counted 43 people asleep on the furniture. I thought maybe they were customers trying out the items before they committed to a purchase, but this seemed rather extreme. I then thought that maybe they were real life mannequins – cheaper to employ actual people than buy plastic ones? I particularly admired the woman who had chosen a massage chair to fall asleep in. With her mouth wide open, and head rolling franticly from side to side, she seemed totally oblivious to the violent shaking she was receiving from the electric chair. My friend returned with the news that all these people were actually the store's cleaning staff who worked overnight. Most of them lived too far away from downtown Nanjing to go home during the day, so instead they just got into the beds on the furniture floor. I thought this was genius, but saw a flaw in the plan. I asked what would happen if I wanted to buy an item of furniture in which someone was sleeping. Would it be delivered discreetly to my home, so as not to wake the occupant? And what would I tell them when they eventually woke up in my bedroom? Another environment where Chinese people can sleep without any effort is on a train. I remember being on an overnight service from Shanghai to Changsha, Hunan Province, and found myself sharing a soft-bed cabin with three other Chinese men. Within seconds of turning off the light, all of them were snoring so loudly that I thought they must be joking with me. However, 20 minutes later, I started to realize the depressing truth that this was in fact real. One guy sounded like a hippopotamus with a breathing disorder. He was sleeping directly below me, and every time he exhaled, the vibration reverberated through my bed. Along with the other two accomplices, the volume of this snoring trio was such that it actually drowned out the noise from a goods train passing by on the adjacent track at 200 kilometers per hour. Needless to say, I got no sleep before arriving in Changsha, yet these three awoke with the freshness of spring rabbits, and had obviously slept like babies. I have also experienced the Chinese office sleep, which to any foreigner is nothing but a mystery. All of a sudden, every person in the office will simultaneously stop working, lay down on a hard floor or on their desk, before being completely unconscious in less than 20 seconds. No amount of phones ringing or doors banging seems to be able to disrupt the office workers from their deep sleep, yet after sufficient rest time has passed, everyone suddenly wakes up and continues the day as though it never paused. The same thing happens on buses, in city parks, and in Internet cafes. Seldom can you visit any of these places without finding someone asleep, unaware of the world around them. I once saw a man asleep while having his hair cut. It seems there is no limit to the possibilities of places and environments in which Chinese can sleep. 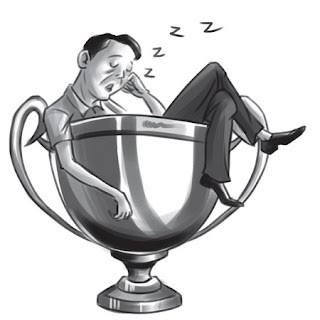 If sleeping were to become an Olympic sport, China would win gold, silver, and bronze. In fact all other nations probably wouldn't bother turning up, defeated from the start by the unequivocal Champions of Sleep.